The results for the first quarter of FY19 showed that the City met the measure for AM and Noon peak, in which results showed little to no change in travel times/Level of Service. The PM peak did see a speed drop of 2 mph (increase of 58 second travel time) in the PM peak times from the previous quarter. With 1 of the 3 peak times falling below a C Level of Service score, this measure is evaluated as red for the quarter. Historically there is an increase in traffic activity in first fiscal quarter due to holiday commerce and commuters along Highway 6. The section north of 59 still continues to be the slowest section, specifically southbound from Brooks to US 59 in the PM peak. Beginning in April, scheduled expansion of Highway 6 from 3 lanes to 4 lanes will help ease traffic. Per the 2010 Highway Capacity Manual, this metric is calculated as the average measured travel speed over the posted speed limit for the corresponding major corridor (avg. speed / posted speed limit). The calculated value is converted into a percentage and translated into a letter grade indicative of a Level of Service (A is the best, F is the worst). 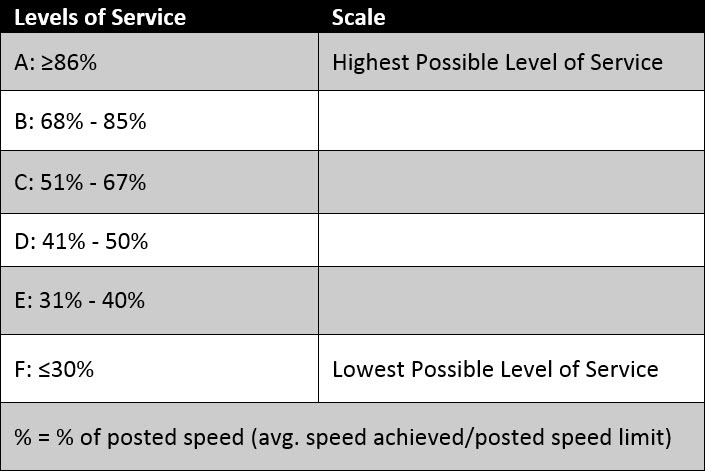 The slower the measured speed compared to the posted speed limit, the lower the Level of Service. Standard Levels of Service are classified by the 2010 Highway Capacity Manual. A target of C means the City aims to have traffic flowing at a minimum of 51-67% of the speed limit. For Highway 6, this means the City aims to have traffic goal at least 23 - 30 MPH during the AM, noon, and PM peak travel times. The City of Sugar Land's most vital vehicular travel corridors support commercial enterprise and quality of life. Shorter travel times help improve both commercial enterprise and quality of life. City of Sugar Land Public Works Department - Traffic Division; The Traffic Division currently uses a Bluetooth data collection method tracking travel time data that is collected daily for the entire quarter. This method of reading travel times better serves to capture the actual average travel times on a daily basis.